BREAKING MY OWN RULE AND IT FEELS GOOD! 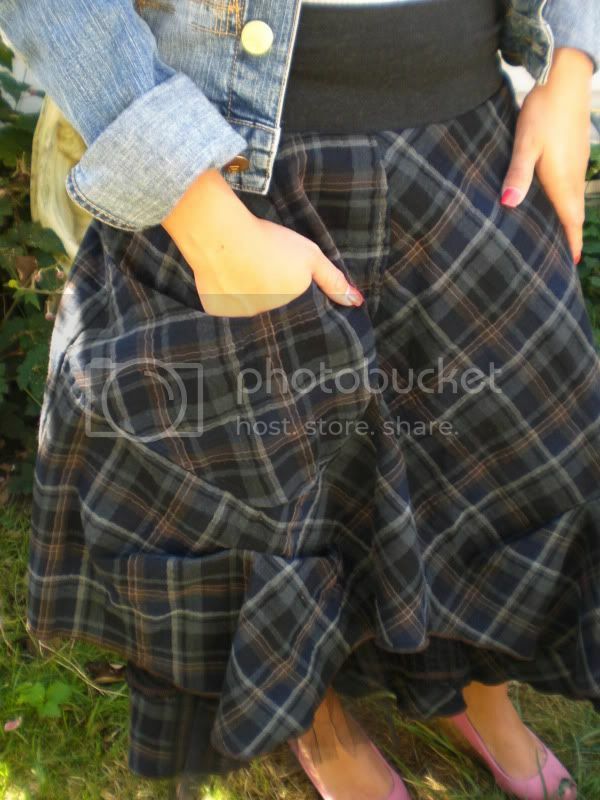 I never really saw myself as a plaid LONG skirt girl, it maybe because I went to Catholic Elementary School and now everytime I see a plaid skirt my mind flashes back to then. Not only that I never wear long skirts, I own one long dress...but that's it. My reasons: 1) Its hard to find long skirts or dresses that are the right length (am a petite lady) and am too lazy to take them to be altered. - 2) I think the more leg you show, in good taste of course, the taller you seem. But I really couldn't help myself when it came to this skirt. I just instantly fell for this Aimee G. creation, the pocket, the tulle, the askwed hemline.. it's more than just a skirt, it's an attitude. 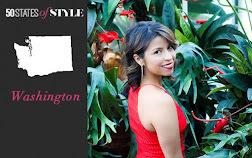 I paired it with a gray low cut tank, the skirt itself already has so much material that the tank takes it from a heavy look to a fun flirty one. The jean jacket has been in my closet for over three years and I can count on one hand how many times I've worn it. Just something inside me couldnt let go of it and am glad I didn't. The blue jean of the jacket picks the blue up out of the skirt. The gold detail in the buttons brings some color to the whole look. Moral to the story: You may know and love your box, but sometimes listen to your little fashion voice and take chances. I don't wear long skirts, but this one in its uniqueness called out to me and am glad it did. Well, when one comes across a skirt like that.. rules are broken. Love it! Plaid makes me think of my Catholic school girl days as well. it is cute and definitely not your old run of the mill plaid skirt. too cute. you had me at the pockets. Love that skirt. I went to Catholic high school, but I think if we could wear plaid skirts like that, I wouldn't have minded the plaid! Plus, I think the length is very cool. Awesome skirt! It's a bit Vivienne Westwood! I know your pain, Alix. 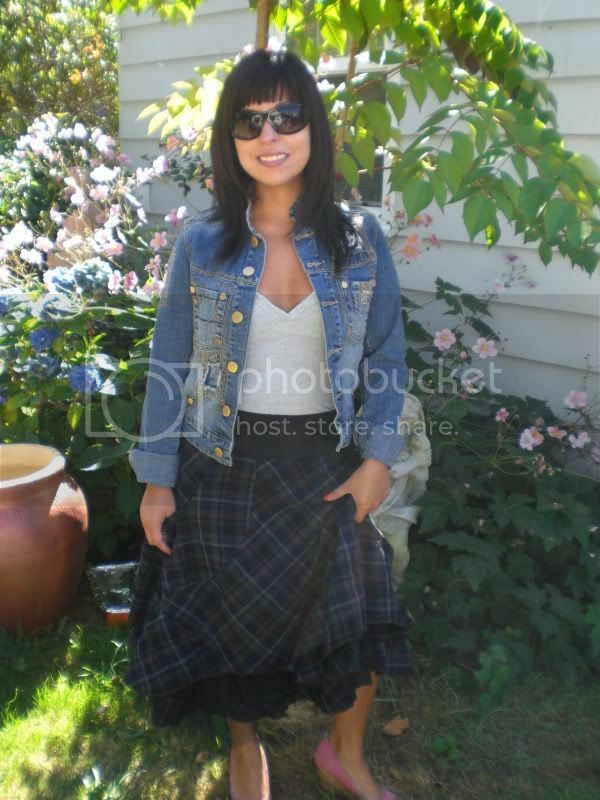 I had to wear the scratchy plaid kilt in high school and I swear it scarred me! Love it on you!! You are too cute! Outfit does look great. I agree about plaid but you pulled it off! Awesome skirt, you look brilliant in plaid.